Charlotte E. (Russell) Stevens, 94, longtime Auburn resident died Thursday December 20, 2018 in the Lutheran Rehabilitation Center in Worcester after an illness. Charlotte was born at the family home in Auburn, MA daughter of the late Charles W. Russell and Reina M. (Mitchell) Russell. 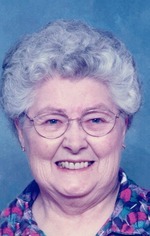 She graduated from Auburn High School in 1942. Charlotte had been a Manager in the Policy Rating Department at the Worcester Insurance Company for 15 years before she retired in 1990. In her retirement years, she was a homebody and enjoyed reading, crossword puzzles and interlocking puzzles that her father made famous in the family, knitting, and cross stitch. She loved music and enjoyed singing. She was a former member of the choir and the women’s group at the First Congregational Church in Auburn. Her beloved husband of 70 years, Howard A. Stevens died in 2016. She leaves her loving children, Robert N. Stevens and his wife Jean, Mark C. Stevens, Cynthia J. Gallant and her husband Stephen and Nancy J. Henderson and her husband Clyde all of Auburn; four grandchildren, Stephen W. Gallant, Jr. of Pomfret, CT, Christine M. Cathcart Gallant of East Brookfield, Jeffrey R. Stevens of Auburn and Gregory R. Stevens of Hudson; also survived by nine great grandchildren and several nieces and nephews. Besides her husband she was predeceased by a son, Gary P. Stevens, and daughter-in-law, Kathleen Stevens. Calling hours will be on Thursday January 3, 2019 from 4-7 pm in the Britton-Wallace Funeral Home, 91 Central St. Auburn. A service celebrating her life will be on Friday January 4, 2019 at 11:00 am in the funeral home. Burial will follow in Hillside Cemetery, Auburn. Memorial contributions may be made to the Salmon VNA & Hospice, 37 Birch Street, Milford, MA 01757.